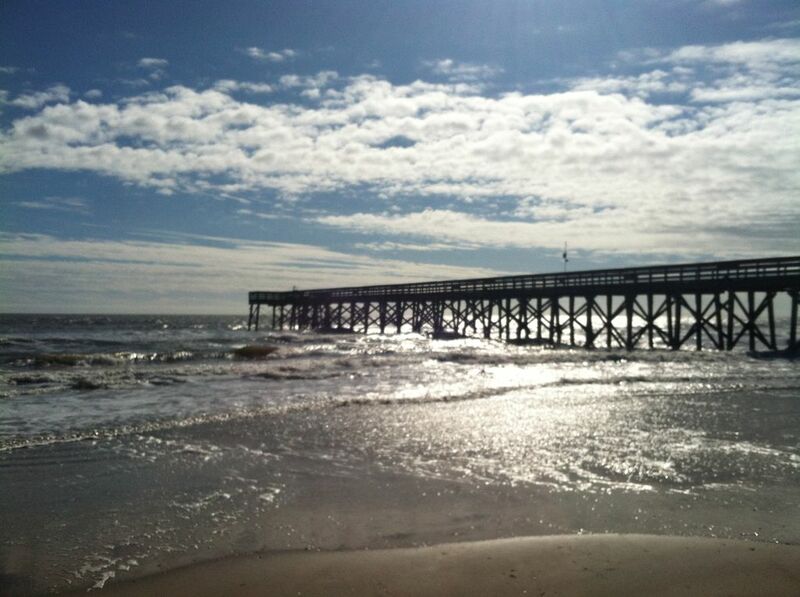 IOP Oceanfront - Best Value on the Isle of Palms - Fishing Pier - Pool !! 222 Sea Cabins 1300 Ocean Blvd. BATHROOM REMODELED ...Enjoy a beautiful sunrise, watch the dolphins frolic; keep an eye on the kids in the pool, or dad on the fishing pier all from the comfort of your living room, kitchen, or balcony. This cute Condo is situated on the second floor of the center 'B' building affording unobstructed panoramic ocean views. There is a queen-size bed in the bedroom, a sofa bed in the living room, and two bunk beds tucked in an alcove (My daughter thinks they are 'Way Cool!' And even her 6’2 uncle has agreed). A close family can really enjoy themselves. A game of Dominos or Yahtzee, anyone???? Located in the heart of Isle of Palms, this cozy condo (490 square feet) is perfectly positioned. You are just steps from the beach and in walking distance to the Island’s best restaurants, shops, and park. While on the Islands you can go Swimming, Body Surfing, Play Volleyball, Dine at Oceanfront Restaurants, Bike the Beaches, Jog, Cruise the Intercoastal Waterway, Sail, Surf, Windsurf, Take in some Live Music, Shop the Boutiques. Check out the Scuba Diving or go Deep Sea Fishing. Relax at a Spa or try Horseback Riding. Kayak, Parasail, Water Ski, Fish, go 'Crabin or Shrimpin,' Walk the Beach for shells, Take a Sunset Cruise, Charter a small boat, Explore Uninhabited Islands, Play some of the South’s finest Golf Courses. IN DOWNTOWN CHARLESTON: Shop at the Old Market. Take in the Charm of this Beautiful and Historic Town. Learn more about Charleston on a Horse Drawn Carriage ride or tour Charleston Bay and Forte Sumter by boat. South Carolina Aquarium, FANTASTIC Restaurants (diverse cuisine), World Class Shopping, Live Theater, Live Music, Museums, and Plantations will round out this visit. Being just 21 miles to the airport and 13 miles to Historic Downtown Charleston, SC makes 222 Sea Cabins a prime location. Grateful for our guest's support!!! Great Views and nothing better than the sound of the waves from your private balcony. We loved the view of the ocean and the sunrise. Very comfortable, clean and amenities were adequate. We would stay there again. Just what a couple needs for a winter vacation! Clean, nicely decorated, and comfortable! Enjoyed the sights and sound of the ocean from the deck, and the private pier was awesome to walk on. Definitely would recommend this rental and can’t wait to return. Clean, comfortable bed. Perfect for 2. Great condo, great location. Beautiful area. Only problem was hurricane Florence. We were forced to evacuate after 2 days. Tim called to be sure we were aware and explained the procedure. He also very graciously gave us a refund for days we couldn't spend there. We will definitely be back, before hurricane season next year. We were very impressed with this property and the views were great. Tim was extremely responsive and accommodating. Tom Fazio designed & Other top Golf Courses. Sea Cabins are directly on the ocean, in the towns center with shops and restaurants. Rates are subject to change. Linens, Taxes, Local Fees and Departure Cleaning are included in 21.5% "tax" rate.